It's taken a few decades for the "organic" lifestyle to work its way into the mainstream, but during the last ten years or so, the desire to eat foods that have been produced in a sustainable, low-tech way seems to have become much more widespread, and the producers and consumers of these foods don't seem to be viewed so much as crunchy, hippie-ish fringe-dwellers these days. Having said that, the movement has honest roots among crunchy hippie fringe-dwellers, and Melissa Coleman's family were some of the people who planted those roots (pun intended, for the record). 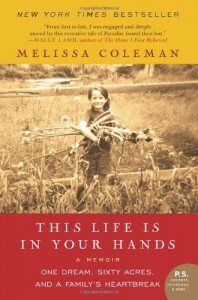 In her memoir, This Life Is In Your Hands, Coleman takes readers to Greenwood Farm on the Maine coast, the pioneering community where her father worked to advance sustainable agriculture...and where her family imploded. In some respects, Greenwood Farm would seem to be an idyllic place to experience one's childhood, particularly during the short and fertile New England summers. Melissa and her sisters could, quite literally, run around naked all day long, and they had the proverbial "village" of caretakers at hand in Greenwood Farm's "apprentices"--college and graduate students who came to work and learn from Melissa's father, Eliot, and who became an extended family. The less-than-idyllic part was that the Coleman children couldn't always count on their own parents. Eliot's first devotion was to the farm, even at, ironically, the risk of his own health; the girls' mother Sue was, all too often, just overwhelmed by the challenges of their everyday lives. The "pioneering" of the Colemans and their associates went all the way--they lived without electricity and indoor plumbing in small houses they built themselves. Melissa Coleman was a child during the years at Greenwood Farm, and it's her evocation of the wonders and feelings of childhood that make This Life Is In Your Hands such compelling reading. 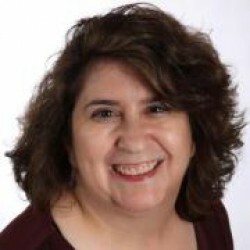 The adults in her life are frequently portrayed as seen through a child's eyes, which makes the effects on that child when they really don't live up to being adults that much more devastating. Without much exposure to other influences, children can be pretty accepting that whatever they know as "normal" is "the norm," but they may still have an innate sense of when the world around them feels wrong. Coleman conveys that well; reading her story, I had the feeling early on that things wouldn't quite work out, but I was completely surprised by the event that ultimately undid the family at Greenwood Farm.